A deceptively easy, soul-warming soup for the cool weather. 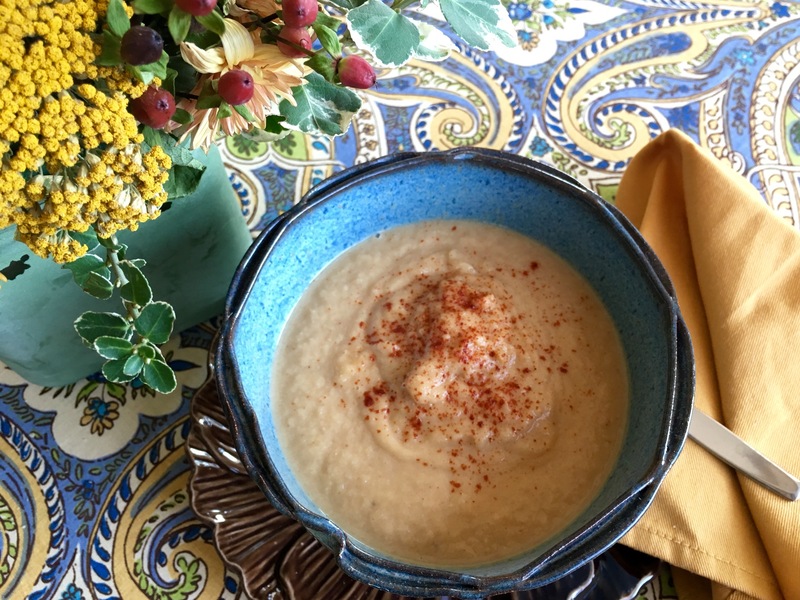 As soon as the temperatures begin to shift downward in late September and the big, beautiful heads of cauliflower appear at the farm stands, I begin making this soup. I like a little heat, so I use a spicy smoked paprika, but if you don’t want heat, you could skip that or substitute a sweet paprika. Want heat, but don’t have smoked paprika? Add a dash of cayenne pepper instead. Depending on the size of the head of cauliflower and your preference in the consistency of soup, you may use a little more broth. You probably won’t use less, unless you like your soup super-thick and/or you have a tiny head of cauliflower. Spicy Roasted Pepitas would make a good garnish and add a complementary crunchy texture. You could also reserve some of the roasted cauliflower florets and use them as a garnish. 2. Place cauliflower florets and chopped onion in a large rimmed cookie sheet, drizzle with olive oil and sprinkle with sea salt. Toss to make sure all the veggies are coated with oil and salt, then roast for about 45-55 minutes. Toss the cauliflower/onions a few times to prevent burning, if necessary. Cauliflower is ready to go once it’s browned a bit. 3. Transfer cauliflower/onion mixture into a pot. Add broth and blend with an immersion blender until smooth. Alternatively, transfer cauliflower/onion mixture into a regular blender, add broth and thoroughly blend then transfer into a pot. Heat over medium heat, until soup is warmed through. Stir in paprika, if using. Taste and adjust seasonings to keep your palate happy. Ladle into bowls and top pepitas, roasted cauliflower florets or a light sprinkle of paprika.